You have probably seen them riding bikes or knocking doors in your neighborhood. Two young men wearing suits and ties, or perhaps two young women, striking up a conversation on the bus, in the park, or in the grocery store. These clean cut young people wear a black name tag bearing the name of their Church, The Church of Jesus Christ of Latter-day Saints. These are Mormon missionaries. When young Mormon boys turn 19 years old (21 years old for women), they are asked to leave their home, family, and friends for 2 years (18 months for women) and devote their full time to the preaching of the gospel of Jesus Christ. 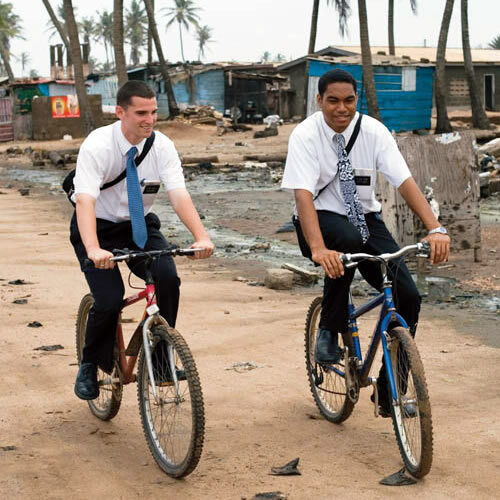 Mormon missionaries serve on a volunteer basis and pay their own expenses. They can be sent to do missionary work in any one of hundreds of countries around the globe. 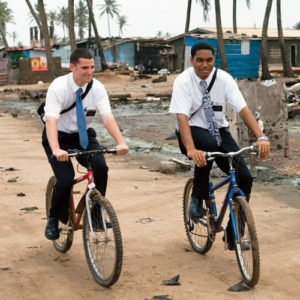 Mormon missionaries do not pick where they go, they are called by a prophet of God, and are frequently assigned to do missionary work in countries where they do not speak the native language. Why Mormon Missionaries do what they do? The Mormon Church is one of the most missionary oriented religions you will find. The Church has over 50,000 missionaries serving throughout the world at any given time. Mormons are missionary focused for two reasons: 1) it’s a commandment from God, and 2) it brings them great joy to share the blessings of the gospel with others. When you see the Mormon missionaries, please take a moment to speak with them. They carry a message of eternal importance that will be joy to the lives of all those who will listen with an open heart and mind. The purpose of this site is to help young men and women prepare, both physically and spiritually, to serve as missionaries for the Lord. The site answers questions about the LDS mission call process, has links to recommended Talks on Missionary Work from LDS Church leaders, provides lots of videos on missionary work, and much more. Come back to the site often or subscribe to the Mormon Mission Prep blog to get frequent updates and spiritual inspiration as you prepare to become a missionary and representative of the Lord and his Church.